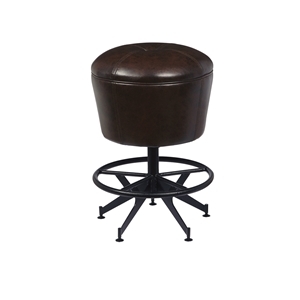 Contemporary take on the classic counter stool with a sleek but sturdy metal base and tufted swivel seat tailored in brown leatherette. 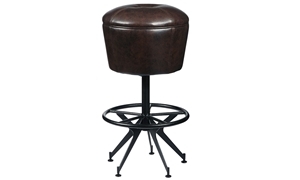 Contemporary take on the classic bar stool with a sleek but sturdy metal base and tufted swivel seat tailored in brown leatherette. 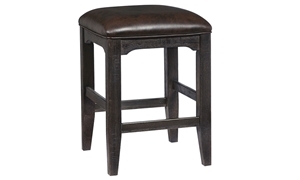 Comfortable counter height stool with seating tailored in dark leather-look fabric atop a wooden frame in a distressed stout finish. 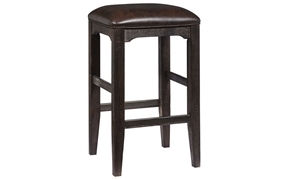 Comfortable barstool with seating tailored in dark leather-look fabric atop a wooden frame in a distressed stout finish. 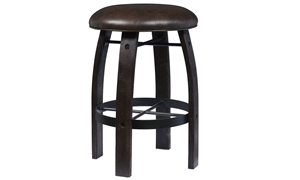 Whiskey barrel-inspired bar stool with a metal footrest, leatherette cushion and gently bowed wooden legs in a stout finish. 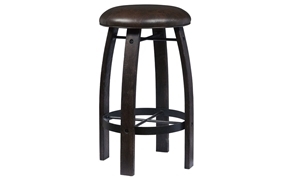 Whiskey barrel-inspired counter height stool with a metal footrest, leatherette cushion and gently bowed wooden legs in a stout finish. 46-inch round counter height table with metal footrest showcases hourglass matched hickory veneers in a distressed blonde finish. 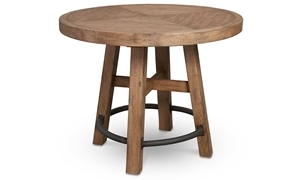 46-inch round bar height table with metal footrest showcases hourglass matched hickory veneers in a distressed blonde finish. 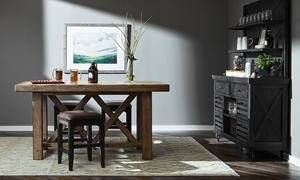 Sturdy 72-inch gathering table flaunts a thick slab top and double X bracing in a hand distressed, rustic, honey blonde finish. 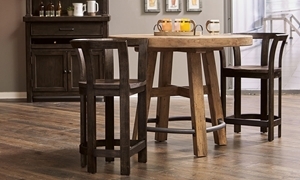 Versatile 48-inch drop leaf table can expand to 72 inches. 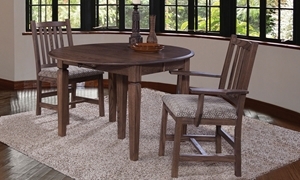 Accompanied by 4 side chairs and 2 arm chairs, all crafted by Amish artisans. 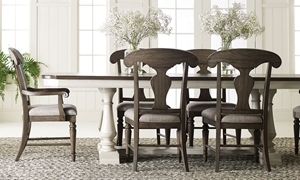 Solid wood farmhouse-style dining set includes 60-inch table, four side chairs and two arm chairs handmade by Amish craftsmen.